What better way to spend a leisurely Sunday morning with an hour or so to kill after dropping the kids off at the nearby swimming pool and you just happen to be in Haslemere. 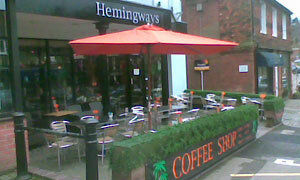 Could have been Costa, Waitrose or the leisure centre itself, but we chose Hemingways. Could have been shopping for gifts or homeware but we just wanted a decent coffee and a wicked piece of cake. Could have sat outside or in, but now being a southern softie (like its fashionable name sake) we took up residence inside Hemingways Coffee Shop. It is a marvellous mix or old and new, classy and comfortable, lively and relaxing with a wonderfully eclectic range of gifts and homeware that combines everyday warmth and charm with the unique and unusual. Shame that the website piccies don't do the place justice. Armed with a great mocha and slab of Rocky Road we sat and chewed the cud, musing over the delights of a recently purchased Cyrus pre-amp & 8XPd amp by my well-to-do host for the weekend whilst Buddha smiled on. Just as well that we didn’t know about Sunday Scrunch (see website for details) otherwise we might have been late collecting the kids -– how could we forget those little darlings. If they were passing by -- Wayne Hemingway.